Verbean tenuisecta is native to southern South America, and has a great capacity for dealing with strong sunshine, heat and water scarcity. In English, it is known as Moss Verbena. Because of this name, some people erroneously believe that the plant requires shadowy and damp environments – like most species of moss do. The truth is that Moss Verbena will do great as an evergreen perennial ground-cover on a sunny green roof. Its USDA minimum zone is 8. Planting Moss Verbena is great if you want to attract butterflies to your roof garden, since they love Moss Verbena nectar and the blooming period for this plant is fairly long. Verbena tenuisecta typically reaches a height of 15 – 30 cm. It will spread out, and single plants having a width of 1.5 meters or more is not uncommon. If grown in full sun, the plant is more likely to stay low to the ground than when it’s grown in partial shade. The foliage is deep green and fern-like. It can even look a bit mossy, which is why this plant is known as Moss verbena in English. The leaves are finely cut and triangular, circa 3 cm long. The plant produces a spike-like inflorescence of five to fifteen flowers that are purple, bluish or lilac. The blossoms are tiny but borne in large clusters. The strongest bloom is in spring; the intensity will then decline as the summer gets hotter, but perk up a bit again when day temperatures begin to drop at the onset of early fall. Cultivars with other flower colors have been developed, such as ‘Alba’ which has white flowers, and cultivars with various shades of pink. The USDA minimum zone for Moss Verbena is 8. Exposing the plant to temperatures colder than 15 °F / -9° C is not recommended. When it comes to soil, Moss Verbena needs well-drained soil. It tolerates low fertility soil. Full sun is recommended, especially if you want to plant to remain low. Propagation can be done with seeds or with terminal cuttings taken in spring. Moss Verbena belongs to the genus Verbena, together with about 250 other species of flowering herbaceous or semi-woody plants. Some Verbenas are perennial just like the Verbena Moss, but there are also many annual species to be found in this genus. A majority of the Verbena species are native to the Americas or Asia. The genus can be divided into two lineages: a diploid North American lineage and a polypoid South American one. All known European Verbena species are derived from the North American lineage. 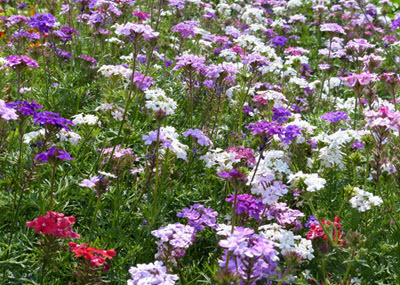 Many Verbena species, hybrids and cultivars are popular ornamental plants. They are sought after for gardens and windows where plants must be capable of handling full sun. Verbenas are a common sight in gardens created to appeal to butterflies, since a wide range of butterfly species like Verbenas, e.g. the Chocolate albatross butterfly in Asia and the Pipevine swallowtails in the Americas. Verbena officialis is a big hit with hummingbirds, and is also planted to provide nectar for honey bees. In several different Old World cultures, V. officinalis was associated with the divine. In Ancient Egypt, the plant was known as the Tears of Isis, one of the major goddesses in the Egyptian pantheon. In Ancient Greek, the plant was dedicated to Eos, the goddess of dawn. In the early Christian era, it was said that V. officinalis had been used to staunch Jesus’ wounds after his body was removed from the cross. When V. officinalis was introduced to North America, the Pawnee adopted it as an for dream divination.